In this episode I suggest a strategy for students wishing to quickly review their knowledge of English and train their speaking skills in view of a job interview or a language exam. I hope this will encourage learners to take the time to work on what is essential when preparing for a test or professional challenge. A few hours of focused training and practice in actually speaking can make all the difference. 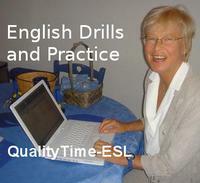 Moreover, with the series QualityTime-ESL Podcasts or Your English you have a tutor free of charge. And you can ask that tutor to repeat as many times as you so wish! The script of the episode is found in the PDF and also directly on this page. See below. P.S. If you are interested in my philosophy of teaching and wish to get a lot of effective exercises have a look at QualityTime-ESL: The Digital Resource Book available in our store. There is also a lighter downloadable version of QualityTime-ESL: The Digital Resource Book, which already contains many of our podcasts and hundreds of other DOC files to help teachers elaborate an effective program. There are times when you want to rapidly review your oral skills because you need to prepare for a stressful authentic situation like a job interview or an oral language exam. It’s a proven fact—to learn to “speak” English, you have practice producing real speech. That’s why I have conceived these interactive exercises where you speak almost as much as the voice you hear. The reasoning is simple: what you need is not yet another text to read or recording to listen to. These are indeed valuable “learning” materials, but they will not help you give in real-time the responses or explanations that the interviewer expects from you in a face-to face meeting. What you need are oral exercises where you will either repeat or respond to stimuli. Moreover, to prove you have attained a certain level you have to show you master language that will impress whoever is evaluating your skills. This language doesn’t need to be complicated but it must show the mastery of interesting vocabulary, varied tenses and correct structures. Moreover, you should work on your pronunciation to be sure you can make yourself clearly understood. This is my advice. Set a goal for yourself. For instance decide that you will work on at least ten episodes of QualityTime- ESL Podcasts every week until you have the interview or oral exam. Start with some of the earliest episodes—even if the titles seem to imply a very easy lesson. Remember you’re aiming for 100% correct English. You don’t want to be considered inadequate simply because you can’t use the verbs “to be” or “to have” in their different tenses or because you confuse the use of the infinitive with the ending in “ING”. By doing just a few exercises from the long list of different grammar points you will easily overcome these difficulties. You can also choose a few topics from the pages of the series called Your English. There are several, such as “Taking an Oral Exam” or “A Job Interview”, that will put you directly in the situation you are preparing for. Other episodes deal with timeless topics that are often used in exams such as moral values, the influence of the media or environmental issues. Don’t be disappointed if, at first, you make mistakes. You can always go back and repeat an exercise or part of an exercise. Learning skills like tennis, football, volleyball, the piano, or the guitar to mention just a few requires hard repetitive training to reach a level of proficiency. By working systematically on these oral grammar exercises you are guaranteed success. I have been an eyewitness as I spent thirty-five years teaching English in France and South America. QualityTime-ESL Podcasts are offered free because I believe in this way of perfecting one’s oral skills. There are self-tests for you to assess your oral progress after every five episodes. If you encounter difficulties, I suggest you get the accompanying written materials (transcripts and worksheets). Many of these are free on our website. If you want any of the others, you can get them at the store for a minimal fee. You can of course share these files with others. With the scripts you have the possibility of working with friends or colleagues and testing your respective competences on different points. This can be just as effective and even more so than sitting in a class and listening to a teacher where you may be called on only every five minutes. The idea is for you to be speaking as much as your tutor whose voice you hear in the podcasts. I hope I have motivated you enough to get started and to keep going until you feel really proficient at English. And let us know how you do on interviews and exams after having worked with QualityTime-ESL Podcasts! Bye for now, and don’t forget to keep smiling. QT-ESL 06 "Simple Past vs Present Perfect"